Fabtech Systems LLC claims a copyright in its works presented at this site. Fabtech Systems LLC authorizes you to view, copy, download, and print material from this web site, provided the material is used solely for personal, noncommercial, and informational purposes, and provided the material is not modified. Information on this web site is provided 'as is' without warranty of any kind, either express or implied, including without limitation warranties of merchantability, fitness for a particular purpose, or noninfringement. Fabtech Systems LLC periodically adds, changes, improves, or updates the information and material on this web site without notice. 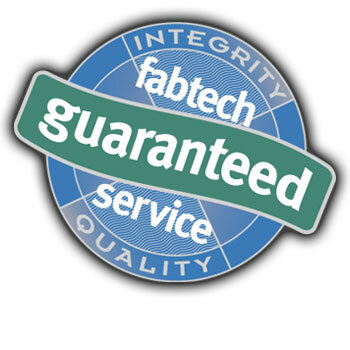 Fabtech Systems LLC assumes no liability or responsibility for any errors or omissions in the content of this web site. Your use of this web site is at your own risk. Under no circumstances and under no legal theory shall Fabtech Systems LLC or any other party involved in creating, producing or delivering this web site's content be liable to you or any other person for any indirect, special, incidental, or consequential damages of any character arising from your access to, or use of, this web site. If you use any link in this web site to a web site not maintained by Fabtech Systems LLC, you will leave our web site. Linked sites are not under our control and Fabtech Systems LLC is not responsible for the content of any linked site or any link contained in a linked site. Fabtech Systems LLC provides these links to you only as a convenience and the inclusion of any link does not imply recommendation, approval or endorsement by Fabtech Systems LLC of the site.